In 1984 I moved my ranching operation to Conard Farms near Elgin, Texas in an area with a very high coyote population density. In the first two weeks after the coyotes discovered my animals, I lost eight sheep to coyotes who were brazen enough to drag a carcass off in front of me and smart enough to hide the moment a rifle was in my hands. In order to keep my animals alive, I had to lock them in the barn. 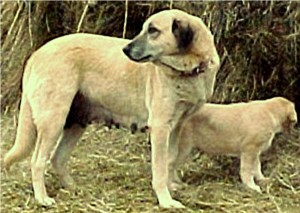 During this time I had been reading a goat magazine with an article in it about an amazing breed of guardian dogs, the Anatolian Shepherd, and they sounded like exactly what I needed. 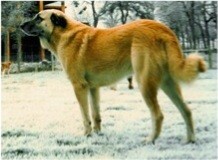 I called the Anatolian Shepherd Dog Club (ASDCA) in California and spoke to Marilyn Harned, the ASDCA club representative at the time. Marilyn gave me two names, including a woman living in Texas (Jean Ebeling) on a ~3,000 acre goat ranch and who owned and used working Anatolians. Jean was kind enough to drive me miles back into her huge pastures to see the pups' sire, Pinarbasi's King, a very tall, beautiful light fawn male she had guarding a large flock of her Angora goats. I stayed in the car while they fed King. Jean said that they fed him every other day. Other than that, he was on his own with the goats and the coyotes. (I was recently told King was her all time favorite guardian dog.) 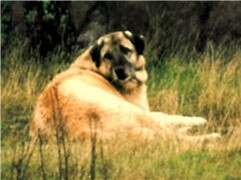 I also met the pups' dam, Hanedan's Basbakan Bambi, who I remember as a very beautiful, large boned, and aloof female. Back at ranch headquarters, we walked to a small group of goats napping in one of Jean's pens. When she called the pups, I was amazed to see three pups quietly get up from the middle of the napping goats. One pup, who was a bit smaller than the others, hung back with the goats and stood watching us cautiously. Luckily, that is the pup I bought. 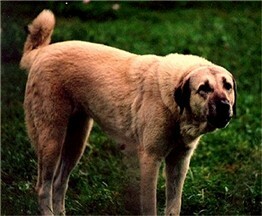 I didn't know then how important a suspicious, cautious nature was to a good working Anatolian. The pup was 7 weeks old and I named him Ebeling's Kasif (Casy for short). I kept the sheep and goats up in the barn with Casy until he was almost four months old and then turned them out together to face the coyotes. While Casy was alive, I never lost another animal to a predator. Casy was a fantastic working male who didn't wander and never went far beyond my property boundaries. Casy never lost an animal to a predator! Although he was an intact male, he never left the property to visit the neighbors' females in heat. He had the perfect aloof attitude of a great guardian and was fiercely loyal. We continue to miss his steady presence! I was lying on the ground to take some pictures of my snow covered house. When the cows approached me, Casy appeared from nowhere and quietly stood guard between the cows and me. Casy refused to leave this protective position as long as I was lying down on the ground. 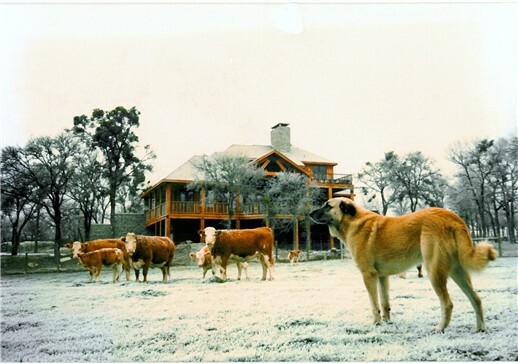 King was a fantastic working guardian at Jean Ebeling's large ranch near Marble Falls, Texas. 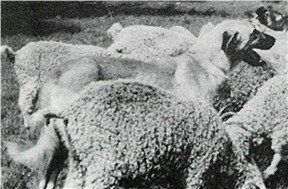 He is pictured here guarding his angora goats. 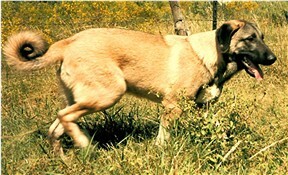 Bambi was an exceptional Working Livestock Guardian at Jean Ebeling's large Angora Ranching operation near Marble Falls, Texas. 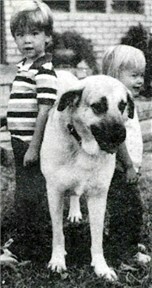 Bambi's temperament was Exceptional... both loving and protective.